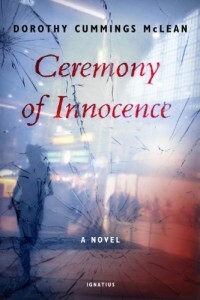 Graham Greene’s The Quiet American retold in modern-day Germany, Ceremony of Innocence is a bit more blatantly Catholic than it’s predecessor, but that doesn’t stop it from making interesting reading. Catriona (Fowler) is a divorced Scottish Canadian journalist for a Catholic news agency who has spent the past two years living with her much younger boyfriend Dennis (Phuong) in Frankfurt, Germany. He wants to get married, but she’s still scarred from her rash first marriage and puts him off with the promise that when her annulment comes through she’ll marry him. Their lives are forever changed by the appearance of Canadian language student and peace activist Suzy (Pyle), who falls in love with Dennis and wants to save him and his soul via Islam. But Suzy has interesting friends and even more interesting beliefs, and ultimately Catriona has to choose between her friend and everything she values most. The gender-flipping of the original story is what made it interesting for me, the random bombings and violence were a plus. If you’ve ever enjoyed The Quiet American you should at least seek this one out at the library, but it still makes for good reading even if you’ve never read Greene’s novel.